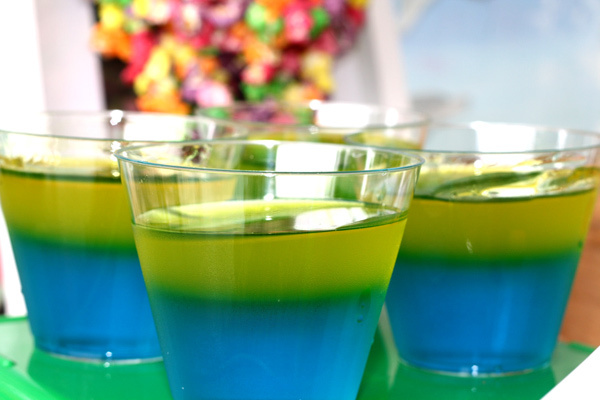 There’s nothing like summer to put you in the mood for a beach party. 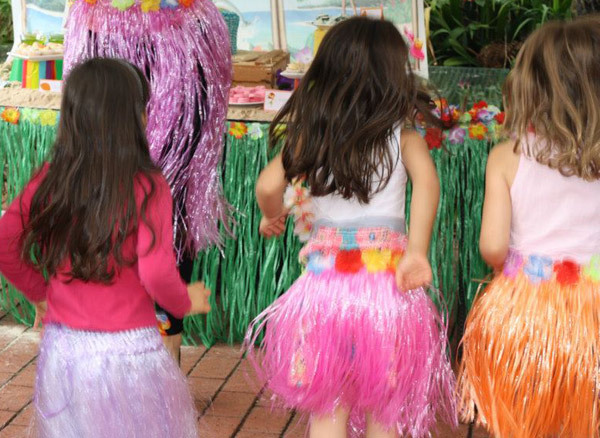 And nothing says beach party quite like a Hawaiian luau. 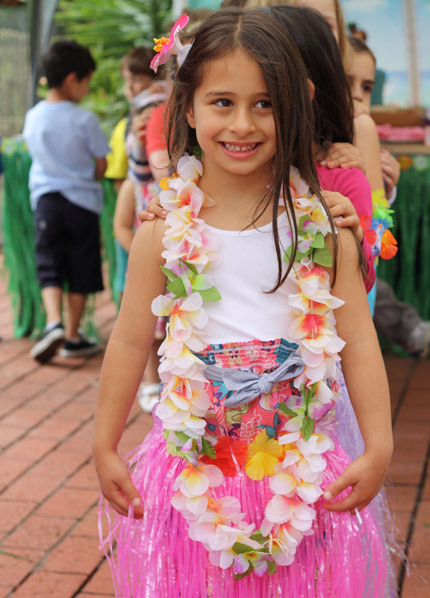 One can almost hear the ukuleles, the lapping waves and the squawking seabirds when gazing upon the party gloriousness that Melbourne mum Pascal created for her daughter Lara’s fifth birthday recently. Come and feast your eyes with us. Lara chose the fun tropical luau theme in excited anticipation of the family’s pending Hawaiian holiday, and then Pascal got to work. The end result sure sings ‘tropical beach escape’ to me. Pascal’s plan for the party was to make it fun in a way that would capture the imaginations of both the birthday girl and her twenty-two guests. Didn’t she achieve that in spades? (You’ll have to pardon the bad pun). 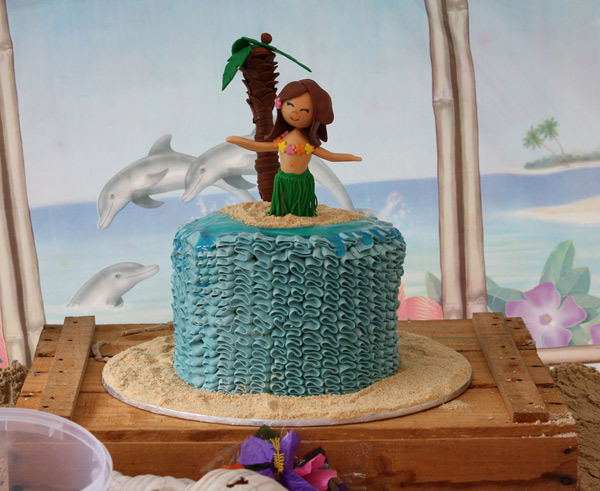 The birthday cake, with its perfectly executed ruffles and sweet fondant hula dancer, is a decadent chocolate number with layers of coconut buttercream. And would you just look at those cupcakes? 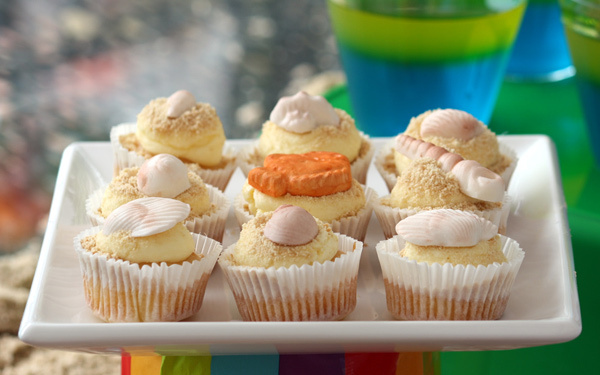 Pina colada perfection in a patty pan, is all, topped with a handmade edible sea shell. Perfect! 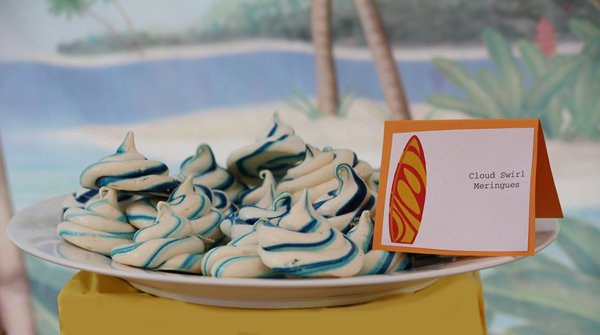 Here’s a secret cake-making tip – Pascal tells us the sand on the cakes is actually crushed plain Marie biscuits. How clever! 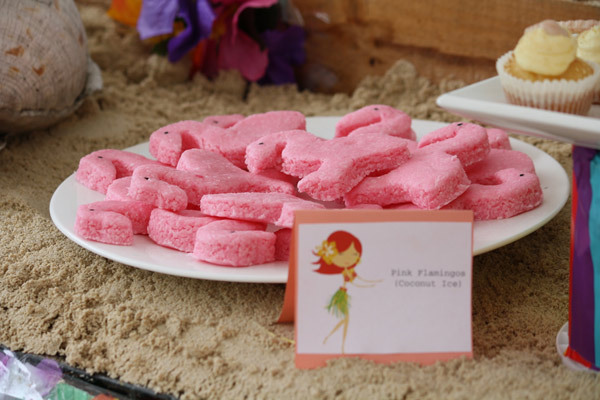 Pascal also made sea-green jellies, delicate cloud meringues, hand-threaded popcorn leis and flamingo-shaped coconut ice treats to tickle the guests’ tastebuds. 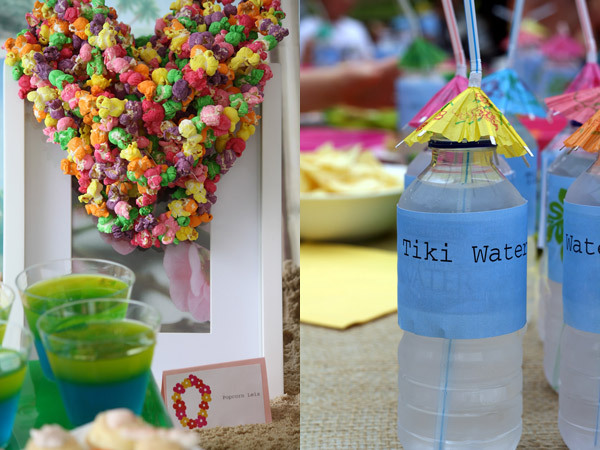 And they washed it all down with aptly named Tiki water, sipped through a pretty paper parasol straw that Pascal found online at Party Post. I’m sure you won’t be surprised to learn that Pascal is a cake maker with her own fledgling small business, Sweet Republic, on the side. Take another long, careful look at the impressive party table though, and you’ll notice all Pascal’s styling ideas are deceptively simple and – even for us mere mortals – totally doable. 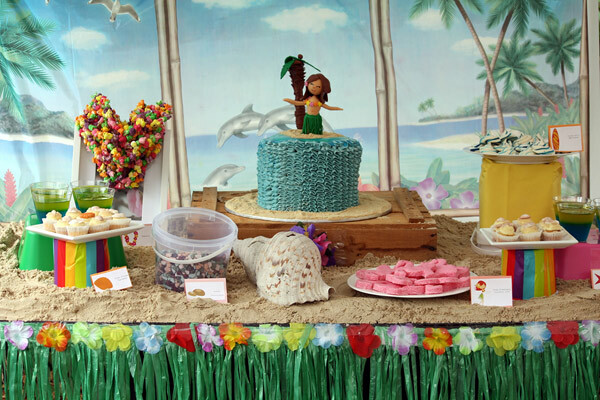 There’s the brilliant layer of sand that sets the beach theme, the grass skirts to edge the table (another Party Post find), an oversized shell and the upturned paper-covered buckets as impromptu cake stands. See? So simple, anyone can do it! Each guest took home a hula hoop (hula, get it?) and a Hawaiian themed lolly bag. Now here’s the birthday girl with a smile to rival any you might see in Hawaii.